But in practice, Meek's work transforming the world's great literature into something experienced on a gaming console is more akin to performance art or theater than it is video games. Meek seems to want to do for the video game generation what public broadcast television did for the television generation, adapting great works of literature into something that could expand the reach of a book. Since Meek couldn't talk about the spy novel they are currently adapting, I asked him to explain one such setting for a book they're considering working on next, Wuthering Heights. In one explorable scene in the Emily Brontë classic, players would find themselves in Cathy Linton's room. "At this point they can see everything that is described in the book, filled out with all manner of objects that we know are in fitting for a room of that sorts," Meek said. In the original work we read that the "whole furniture consisted of a chair, a clothes-press, and a large oak case, with squares cut out near the top resembling coach windows." Words pulled directly from the book float into view at the appropriate times, like "In vapid listlessness I leant my head against the window," when the book's narrator, Lockwood, moves into the box bed. Players would hear the wind outside, described in the book as howling. "From there, the player gets to pick up the books (Myst style) from within the box bed room," Meek said. "In these books the player finds the text that is alluded to in the book." In this case, that means viewers can expect to find "an excellent caricature of my friend Joseph, - rudely, yet powerfully sketched" and "faded hieroglyphics." One of the best books of all time, Wuthering Heights is to be made into a film and with the talents of hotshot producer Dorian Razmirez at the helm it looks set to be the movie of the year. Sabrina Leon is struggling to save her career and when she is cast as Cathy it's the lifeline she needs, if only she could appreciate it. Viorel Hudson plays the brooding Heathcliff - but can he handle the stress of being on location? Reading "Jane Eyre," I took Charlotte Brontë's physical clues about her heroine ("I was so little, so pale, and had features so irregular and so marked") and filled in the gaps: I created my own portrait of Jane. Her fellow inmates at Lowood wore "brown stuff frocks of quaint fashion"; I designed some simple dresses for them. Jane looked out at "still green fields"—I colored those fields dark green. 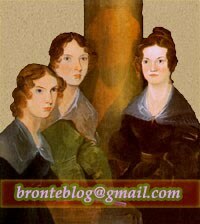 Corina Walbert posts on Associated Content about her Favorite Novelist: Charlotte Brontë; more on Charlotte and Arthur Bell Nicholls's Irish honeymoon on the Brontë Sisters; Felice's Log reviews Jane Eyre 1983; Rats Penats briefly posts about Wuthering Heights 1939 (in Spanish) and The Literary Gothamite reviews the Hesperus Press edition of Tales of the Islanders by Charlotte Brontë.